This was my last lunch in Singapore so I had to go to an institution even if it was a little bit out of the way. I was meeting a friend from New York whom I hadn’t seen in ages and who found out that I was in Singapore that week through Face book. The last time we had lunch together was at the tiny fashionable Bar Pitti in the west village around ten years ago. 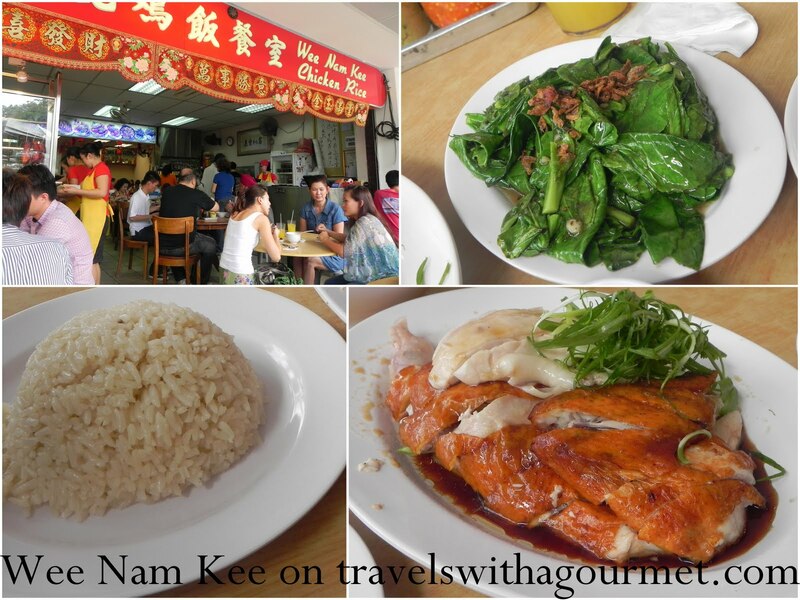 She is a chef and obviously a food lover so she agreed immediately to a lunch date at Singapore’s well-known Hainanese chicken rice restaurant, Wee Nam Kee located in front of the church in Novena. After checking out of our room and leaving our luggage at the hotel, my eight year old and I jumped into a cab and rushed over to Wee Nam Kee. When we arrived at 12:30, Zaina was already there at one of the outdoor tables. It was great to see her after so long so before we started talking non-stop, we flagged one of the busy servers over to take our order of a large portion of the famous chicken – half roasted and half steamed – three portions of flavored chicken rice, clear chicken soup and sauteed kailan (Chinese broccoli or Chinese kale) with garlic. The place was packed and since there were hardly any tables left, they were busy making sure that everyone got their food order quickly so the tables could be cleared for the next round of clients. We didn’t have to wait long for our lunch and the platter of chicken was placed on the table along with a bowl of chicken broth, three plate of rice and the sauteed greens. We dug in immediately and started on the chicken – the roast one was delicious with crispy skin and tender meat while the steamed one was soft and oily the way it’s supposed to be. It was served with an oily soy sauce and garnished with lots of shredded spring onions. Each table had a little tray of traditional chicken rice condiments – plastic pots of ginger sauce and chili garlic sauce. The rice was very good and although it was flavored with both chicken broth and chicken fat, it wasn’t oily at all. The kailan was surely wok-sauteed in high fire which is why it was green, not overcooked and complemented by the crispy garlic. As we worked on finishing the chicken and the rice, we also chatted non-stop about each other’s lives since we last met. We’d both gotten married. She had stayed in New York and is now executive chef at the Conde Nast dining room (cooking for Anna Wintour and other Vogue-types) while I had moved to several countries given up the restaurant world to be an expat wife and slummy mummy of two. Her kids had grown – one was married with two kids making Zaina a hip grandmother and her son was just finishing university. So many things to share, catching up to do and the best part was that we were enjoying the time together with the bonus of good food in Singapore. We were shooed out of our table as soon as our plates were empty. After paying just SIN$27 (around US$20), we hopped into another cab and headed to PS Cafe at the Paragon where he had money to spare for a much-needed espresso and dessert. And of course, more non-stop chatting. P.S. When I told my sister (a long-time Singapore resident) that I had been to her favorite Chicken rice place, she asked if I had the fried bean curd and I totally forgot to order it so now, I need to go back for another Chicken rice meal. *Open daily from 10:30 a.m. to 2:00 a.m.